Faraway Press: The Online Home of John Jackson Miller: Lost Tribe of the Sith Spiral TPB hits shelves! 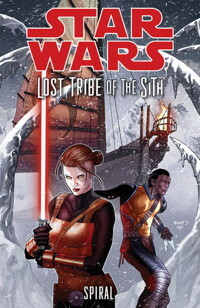 I'm running behind on a number of things, so here's the first: the graphic novel collected edition of Star Wars: Lost Tribe of the Sith - Spiral arrived in stores on Wednesday, representing the latest chapter in the tale of the Sith castaways on Kesh. You can find the book at your local retailer or order the book here. I've also established a landing page for the book here on the site, though I still have to do production notes for a couple of the issues. Speaking of, I added trivia for the second episode to the page for Overdraft: The Orion Offensive. I also brought the Glossary and Timeline pages up to date for the sixth episode. The seventh episode, "Strike Price", releases Tuesday for Kindle subscribers. Time's running out to get the entire work at the serial price of $1.99; click here to subscribe! And I have added a landing page (overdue, naturally) for Star Wars: Knight Errant - Escape, which is also now available as a graphic novel. All the notes for that one are done and on the site. I have also joined Goodreads, at long last: follow me here. I've got a contest on there, too: we're giving away a signed Advance Reader Copy of Kenobi. Enter here!